Unlike some driving schools/Instructors Alpha Specialise and only offer Automatic Driving tuition, for many driving schools getting an older automatic car is a way of filling an empty diary, Alpha has years of experience training clients to drive automatic cars, whatever your requirements passing the L test, confidence building sessions, rehabilitation or refresher training of experienced drivers, we can Help you. I'm a DVSA Approved Driving Instructor with over 25 years experience. I am Specialist Driving Consultant in Automatic Vehicle Tuition for clients with Physical Disability, Cognitive, Educational, Emotional and Hearing Specific Needs. (NCORE) National Centre of Rehabilitation Education. Oct. 2010, NCORE, Practical Driving with Adapted controls (module 2). MSA National conference Holiday inn Doncaster Teaching Pupils with Special Needs, e.g. Autism, Aspersers, ADHA Dyspraxia and Dyslexia. Derby Drivability, London Road Community Hospital, Derby. John Rogers,DSA ADI Julia Malkin DSA ADI, MBE. 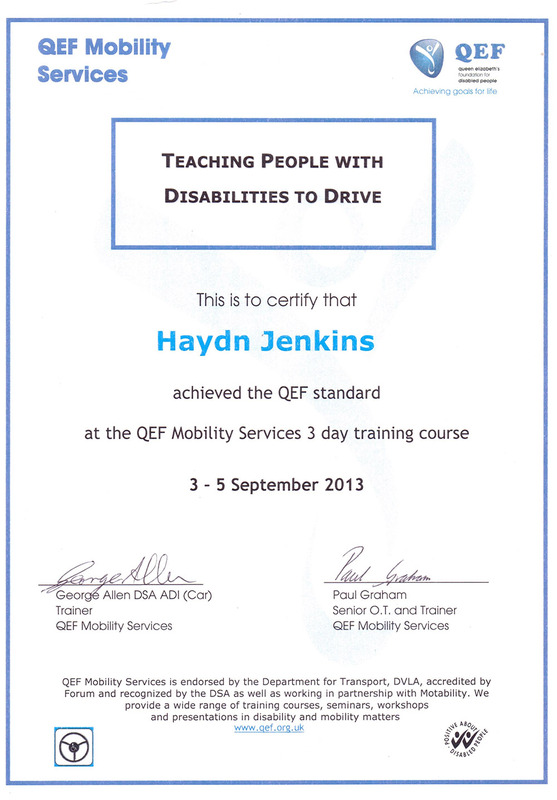 Sep. 2013, QEF 3day course teaching people with disability to drive. Jun. 2014 , QEF Advanced Hi-Tech Controls 1 day course for teaching those driving WAV's. Apr. 2015 , DIA Drivers with Diverse Needs, Sue Vernon 1 day course. Nov. 2015, MSA East Midlands Regional training day, John Rogers DVSA ADI Disability Driving Instructors, Dee Caunt British Dyslexia Association. May. 2016, 1 day with Julia Malkin MBE, Aspergers, Autism & Special Needs. May. 2016, Mobility Roadshow, Get Going Live, Silverstone. Oct. 2016, DIA Drivers with Nero-Diversity, Sue Vernon 1 day course. I have signed up to the DVSA Voluntary Code of Conduct. The pass rate I achieve is well above the national average. I provided structured client centred tuition, on a one to one basis. My prices are competitive and reflect my investment in specialist training, continued professional development and mobility equipment I provide. Older Driver, Safe Driving Assessments. Presentations on Driving with Disability, ADI's & Sen' Disability. Occupational Therapists, I can work with you to arrange for your client to learn or return to driving. 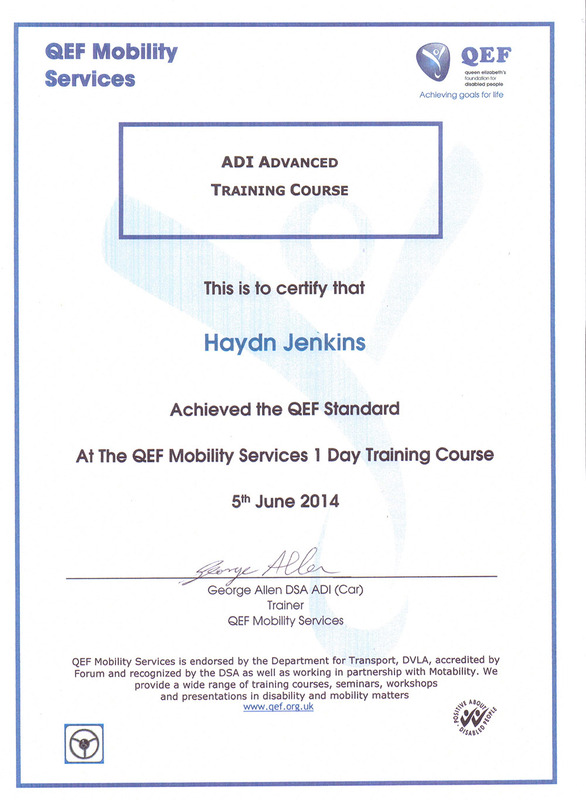 I'm registered with Motability to carry out adaptation familiarisation and the Learner Driver Scholarship. I have an excellent working relationship with the 3 assessment centres covering this area, I can also provide reports to support your client, if attending or returning for Assessment at a Mobility Driving Assessment Centre. Specialist training is carried out in my adapted Vauxhall Meriva 1.7 Automatic, which has excellent accessibility and a wide range of adaptations to cater for clients individual needs, there is also available a Digital Hearing Loop for those with hearing problems, for clients and instructors safety the vehicle is fitted with a digital image recording device filming externally out of front and rear windows, no images or sound are recorded inside the vehicle. Adaptations supplied and fitted by All Shropshire Mobility. Panoramic rearview mirror & additional door mirrors. If you need more complex adaptations or we can't get you in my vehicle, then I can arrange tuition in your own Drive from Wheelchair vehicle, and if you are leasing a vehicle from Motability and using adaptations for the 1st time this Familiarisation tuition could cost you nothing see Familiarisation Tuition. Wheelchair users, In order to make you as independent as possible I will help you, where possible, learn to transfer yourself from your wheelchair to the car seat. In your own car there are many options for you to achieve this including various hoists and roof box mounted lifts. There is also the option of driving from your Wheelchair. Please contact us if you are having a car adapted/built to learn to drive in as a dual brake could be fitted at the same time to help you learn safely (Motability will often supply this if they are supplying the vehicle or driving tuition under the MMAP or Learner driver scholarship).